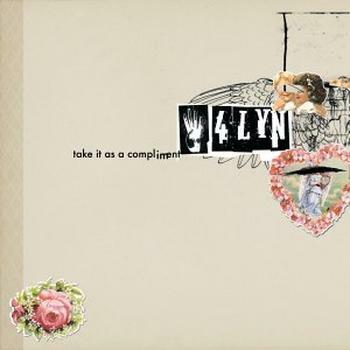 The title of Germany's biggest nu-metal export 4LYN's third album seems to be an advance reaction to whatever the critics were going to say next: TAKE IT AS A COMPLIMENT. After all, the Hamburg-based band found success with their first two albums and their relentless touring, but little acceptance. Reviewers and consumers alike were quite unflattering in their comparisons to the popular nu-metal bands the group was clearly -- to put it nicely -- inspired by. So what, the group seemed to say with their new album: If people think we sound exactly like Papa Roach or Korn, we'll just take it as a compliment. Obviously, this attitude isn't helpful when it comes to the originality of 4LYN's latest bunch of songs: the group simply decided to stick to their guns and record yet another album that dives headlong into every nu-metal cliché defined by their American forerunners. The guitars riff in that Korn-ish buzz, there are synth sounds for contemporary sheen, and the singer yells psychotically and croons singalong melodies, sounding like Fred Durst and Jacoby Shaddix at the same time. It all sounds utterly familiar and hasn't dated well, even though some of the songs can be enjoyable once you accept that they are utterly generic -- the first single "Kisses of a Strobelight" is solid power pop/rock, and "Drama Queen" stands out as an odd, but interesting track. The production is thoroughly solid, and of course, nothing on the record is entirely terrible -- otherwise, the band could have never found the level of success it did. The craftsmanship is there, as is the willingness to entertain -- exactly the type of band you'd want to perform at a party where nobody is paying attention to the music anyway. This review was written for the All-Music Guide on January 5, 2008.